As an Africentric-based institute that focuses on educational excellence, the Delmore “Buddy” Daye Learning Institute (DBDLI) assists learners of African ancestry in Nova Scotia, identifying and addressing gaps and equity issues through research, publication and education. In many regards, the DBDLI is the clearing house in Nova Scotia for those with African ancestry, passing along wisdom and shaping scholarship. This project started with the notion of the DBDLI as the collectors and distributors of knowledge related to African ancestry in Nova Scotia. Ghanaian culture was a focus, in particular Adinkra symbols, which are essential in that culture to express ideas. These symbols, woven into cloth and stamped on pottery, are rich with proverbial meaning, depicting historical events, human behaviour and attitudes, animal behaviour, plant life and the shapes of objects. Adinkra cloth uses a combination of symbols for storytelling and passing on knowledge, an apt trope for DBDLI, an organization that acts as elder for its community. Adinkra printing blocks, often made of woodcuts or carved calabash (a type of gourd), are inked for use in print, using natural dyes. From architecture to signage, from material to finish, the Adinkra woodcuts informed the overall design led by a consortium of Ekistics Planning and Design and Form:Media. At the large scale, individual offices seem to have been carved from a large block with a blackened exterior and natural wood interior finish. At the small scale, multiple stacked inked blocks make up walls. Simple black-vinyl linework, evocative of screen printing and handmade cloth, provides safety and privacy screening on glass. Black and white is the basis of the project’s palette, along with hints of red and yellow, referencing its African roots, in addition to a sparing use of brass on door identification, lighting and desk surfaces. The 4,500-sq.-ft. environment provides flexible work space meant to be either open or sectioned off. A movable partition allows a large community space to subdivide into a boardroom and a classroom, while the rest of the office combines private and open workspaces. In addition to culturally-appropriate artwork, the office includes a gallery for the display of contemporary artwork from the community. 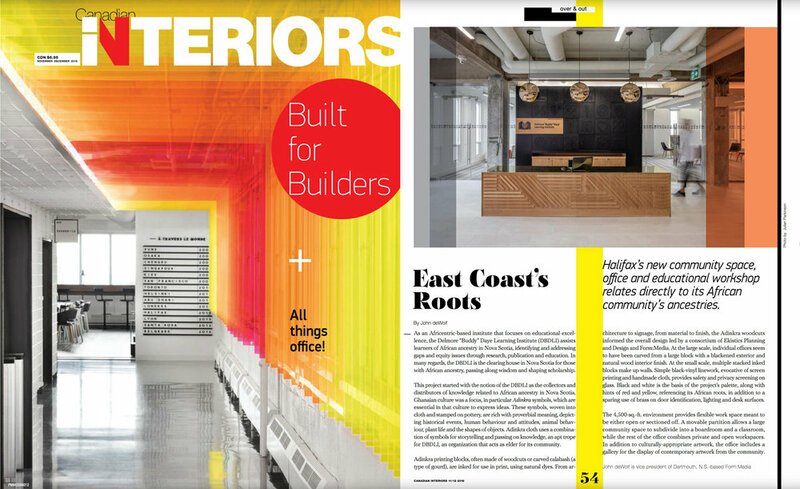 Since 1964, Canadian Interiors has been longest running interior design magazine in Canada—a must-read for all interior design professionals across the country. Canadian Interior publishes six issues, plus a guide, per year. RGD Insights Top 5 graphic design cameos in film. world is experiencing change as global influences shift to demonstrate a stronger stance on human rights, among many other influences. As public institutions, most have legal obligations to provide and maintain accessible environments. While some museums embrace this necessity, others meet the minimum standard requirement, and some evade the issue entirely. If museums have a mission to preserve and share of knowledge with the public, the audience cannot therefore be segregated to include some but not others—this is particularly problematic with most artifact and visual based museums. While impossible solve all issues related to accessibility and the museum, this practicum was intended to suggest improvements to yield a more inclusive environment, and for this designer to be more acutely aware of the issues related to disability and in the museum context. The practicum title, design within reach has multiple meanings. First, it suggests that better design is achievable for everyone when considering the needs of all users: we are capable of better design, it is within reach. From another perspective, design within reach was an apt title given the three disability groups—the blind and people with low vision, the deaf and hard of hearing, and people with mobility issues—and their needs related to proximity. Generally the space immediately around us, the elements of the built environment that are within grasp are important for persons with disabilities. Research provided the foundation for scrutinizing the experience for all museum visitors. I began this project with a supposition: the museum experience has similarities to that of a story. The exhibition is a sequence of experiences in a curated and, at times, heavily narrated environment. The notion of sequential spatial experiences with undertones of communication led me to employ theories of narrative as a means to frame my discovery process and reach a design outcome. As the research progressed, however, I realized that a mere sequencing of experiences may not be enough to conclude that exhibitions are narratives, in the strictest theoretical sense. While theories of the narrative did not directly improve my ability to address disability and in the context of museum, the three areas of personal interest when combined—a building typology (museums), an undeserved audience (disability in the museum context), and a theoretical framework (Narratology) to tie all three together—resulted less in a collectively exhaustive triad of topics and more so in mutually exclusive pairings. Thus, this journey of discovery through design, while not as predicted, yielded an outcome informed by a research and design process that arguably made for a better experience for all. The practicum centres on The Human and Natural Disaster Museum, a fictitious museum located in Halifax, Nova Scotia. Maritime calamities are a way of life for many living in coastal communities: loss of livelihood due to environmental change, loss of life to natural and man-made disaster, and other all-too common tragedies related to scouring the land and ocean for resources. Delving into the history of narrative theory is the notion of a fable; the purpose of the fable is intended to reveal something about humanity, or to teach a lesson. According to David Herman (the Department of English at Ohio State University), “fable is a brief narrative told in order to provide moral instruction or to transmit an ethical point of view” (Herman 2010). To reveal something about humanity rings particularly strong when thinking of both museums and disasters; more so when considering the exhibit experiences as a narrative environment. From another perspective of the narrative, according to Todorov, a story is structured as: equilibrium, disruption, resolution, and new equilibrium. Choosing disasters as a topic was deliberate and purposeful. Disasters, man-made and natural, are based on a disruption; an unforeseen event with tragic and / or costly consequences. These four terms formed the parti pris for this practicum, and informed most every decision from the design of the logo to the sequencing of exhibition halls. Of particular relevance, from an adaptive reuse perspective, is the notion of a new equilibrium. The site, a former coal-powered electricity generation station, was chosen primarily for its scale. The decision forced me to consider the origins of the building and site. From a cultural heritage perspective, it would be remiss of me not to address the ecological repercussions of coal mining, both in the design of the exhibition programming and in the structure itself. The visitor experience within the museum was also, therefore, part of the interpretive experience. Herman, David. Routledge encyclopedia of narrative theory. London, Routledge, 2010. The Faculty of Architecture aspires to offer widely recognised and highly valued design and planning undergraduate and graduate programs that promote a respectful, collegial, interdisciplinary culture of teaching, scholarship, and service within the University and beyond. 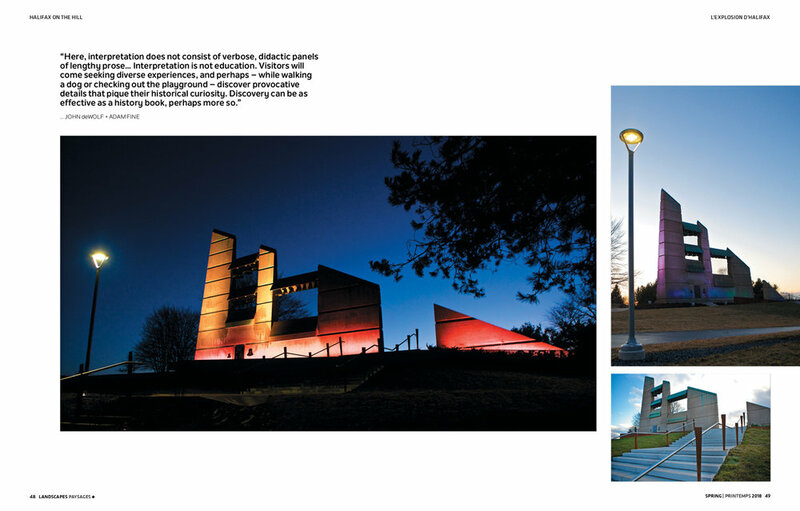 NETWORK is an annual publication of the Faculty of Architecture at the University of Manitoba, Winnipeg, Canada. NETWORK is circulated to Faculty of Architecture alumni all over the world, and professional and industry firms throughout Western Canada. NETWORK welcomes articles, comments, and information related to issues affecting the design community. You work for them: an online source for design resources and also a philosophical reminder of what we do. As a designer, I understand—somewhat—the use of the service, though I have yet to use it. As a phrase, however, I interpret it as both inspiring and incomplete. Three simple words: you, them, and work. When I hear “you work for them,” I initially think of the client-contractor relationship. Upon mention of this phrase, Dominic Ayre, creative director at Hambly & Woolley, pointed out something that had not yet occurred to me: “With Hambly & Woolley, my name is not on the door—so arguably, I’m working for somebody.” Let’s unpack this. Work is a means to earning an income, a place we go to and the products we produce. Like Dominic, I am employed by someone. My business is not associated with my name, neither will it, nor should it, be. It’s simply not relevant. Perhaps this touches on the crux of this article: I neither work for acknowledgement of what I produce nor to be recognized for my place of employment. For whom I work, however, I do care. Lionel Gadoury, principal of Context Creative, is succinct in his summary: “We are hired to solve a problem.” Agreed. We are commissioned as discipline specialists and subject matter experts, and, Lionel says, “We’re hired to solve a client’s needs and objectives. We’re hired for our ability to understand the audience, and what it’s going to take to engage the audience to help clients achieve their goals.”As designers, I hope we can all agree on this perspective. Do we? Clients recruit us for our insight, and for our ability to engage audiences. As Dominic states, “In the simplest way, when it comes to a financial business agreement I work for them [an employer]; when it comes to the work that we do, we work together.” Both designers and I agree: they (clients) hire us (contractors) to help with a job. I have an additional perspective on the phrase “you work for them.” Designers are hired to listen, to learn and to create. We are not hired by a patron to accord us the privilege to pursue our whims and fancies, to express a unique personal style, to recite common themes, or to explore new ideas at the expense of the client, or worse, the audience. As designers we are anonymous; there is a greater good to consider. I believe in the client-contractor collaborative relationship. I believe in a discovery process that generates a clear definition of the problem, a design evolution that sheds light on the user and solutions that are responsive to client and user. I find inspiration in a process that allows me to feel empathy for the individual or the collective for whom the design is intended to serve. Lionel and Dominic individually have built careers around establishing relationships. Likewise, Alison tells me, “We don’t enter a new project without knowing the client, knowing the audience.” Her firm has built a practice around a process that yields that understanding. However, I also believe the designer’s responsibility, in addition to finding a solution to the client’s problem, is to advocate for anonymous. When I hear the phrase “you work for them,” I equate “them” as the groups not at the table—the audiences rarely considered, and the groups left out of typical conversations, discovery processes and user research. For me, “them” are also those without a voice. They are the multiple audiences for whom I also work for. The anonymous. A designer’s insight and ability to engage audiences should also be harnessed as a means to remind our design team and client to address topics that may otherwise not receive attention. Our role is to identify stories of underrepresented groups, stories that challenge conventional narratives and stories that may be painful or difficult to tell. For this designer, that’s why I find the phrase “you work for them” to be both inspiring and incomplete. You don’t know me, nor should you—ever—and certainly not for the works I create. As a designer, I strive not not let my output in any way be recognizable as crafted by me. I wholly believe I should be anonymous in the products I craft. Designers should be at the table as representatives of the the overlooked, the voiceless, the anonymous. I see a future where the work we produce is recognized for the audiences it serves, not for the individuals who created it. “You work for them” is not a statement of what we do, rather a reminder of who we do it for. Applied Arts is Canada's premier magazine of visual communications. Applied Arts explores the strategic and cultural forces driving creativity in Canada and features the resulting work—whether groundbreaking, unusual or otherwise exceptional. Printed quarterly, the magazine is written for, and by, thought leaders and emerging talents in the visual communications field. Since 1986, Applied Arts has delivered gorgeous imagery, strong opinion, timely information and essential industry insight to a readership of 46,000 creative and marketing professionals. Summer 2018 Issue This issue suggests that in addition to our insight and ability to engage, we are also hired to represent all audiences. Why RGD? Our involvement creates a stronger design community. ON DECEMBER 6, 2017, Halifax marked the centenary of the Halifax Explosion, with the opening of Fort Needham grounds as a Memorial Park. At 9:04 a.m., hundreds gathered for a minute of silence; ships’ horns sounded; a cannon blasted from Citadel Hill. And around the assembled crowd, even in the drenching rain, the memorial landscape told its story, evoking intimate images of the disaster so long ago. “WHEN BRITAIN IS AT WAR, Canada is at war. There is no distinction,” stated Sir Wilfrid Laurier in 1910. But the First World War, when it came, churned on, and neither Laurier nor Prime Minister Borden could have predicted the profound consequences at home, or on December 6, 2017, in Halifax. During the war, military and merchant ships mustered in Halifax’s Bedford Basin, many destined to make the dangerous Atlantic crossing to the European theatres of war. On that tragic December day, two ships in the Narrows collided: the Norwegian SS Imo, a merchant vessel headed to the U.S. to load supplies for Belgian relief, struck the French SS Mont- Blanc laden with the raw goods for the production of explosives bound for Europe. The collision generated the largest non-nuclear explosion of the twentieth-century. In the blink of an eye, the community of Richmond was wiped from the face of the city. One in twenty-five succumbed to the disaster; one in five suffered injury, many with lifelong afflictions, and one in ten were left homeless. Today, no human witnesses to the tragedy remain. But the Memorial Park on Fort Needham Hill, with its vantage point overlooking ground zero of the explosion, will forever be tied to that devastating event. When our teams began to prepare the hill for the centenary, we launched a joint process in awakening memory. Ekistics Planning & Design had shaped the site’s Master Plan with two clear goals: to significantly enhance Fort Needham’s power as a memorial for the city, the province and the nation, but also to meet the needs of the community for an improve local park. As the design took shape, we asked a single recurring question. Could we let the hill tell the story? We believed we could. This was the shared vision of our two teams—the Ekistics landscape architects and the experiential graphic designers of Form:Media—and the basis of our interdisciplinary approach. Norwegian researcher Alexander Refsum Jensenius suggests an interdisciplinary approach to design differs from the collaboration of multiple disciplines working together to achieve a single goal. Interdisciplinary suggests a synthesis of approaches where knowledge, methods and process are integrated. The landscape architects of Ekistics Planning & Design looked to integrate thematic content into landforms, while the experiential graphic designers of Form:Media considered swales and retaining walls as much as they did words of interpretation. Through materiality and form, our two teams worked as one. The design features two corten steel retaining walls, each the length of the two ships, which are pierced with the ship’s specifications: length, width, and place of origin. Simple wooden benches along the length of the “Mont-Blanc” wall indicate the content on board. Further inspection reveals the weight, volume and cost of these dangerous goods. On the new Richmond staircase, which leads up the hill to the Memorial Bell Tower built some three decades ago, ballustrades are placed like shards of warped steel as if rained down upon the earth, each punctured with the name of a school, church, or business lost. Here, interpretation does not consist of verbose, didactic panels of lengthy prose. On one memorial wall of text, the upper half is perforated and light, while the lower half uses rivets of steel to complete the text as if below a waterline, an anamorphic experience. The narrative is further evoked through lighting on the monument. Interpretation is not education. Visitors will come seeking diverse experiences, and perhaps—while walking a dog or checking out the playground—discover provocative details that pique their historical curiosity. Discovery can be as effective as a history book, perhaps more so. The Fort Needham Memorial Park invites visitors to freely contemplate the 1917 explosion their own way. The experience, for many, will grow deeper with time. The power of that annual moment of silence lies in the landscape. Authors John deWolf and Adam Fine are experiential graphic designers who worked with Ekistics Planning and Design to implement the park’s master plan. Their story is a follow-up to “Community and Commemoration,” by Sandra Cooke, in LP’s “Time” issue, 2016 winter (vol. 18, no. 4). For over 25 years, I have been scrutinizing everything from interpretive planning documents to location plans, message schedules and construction drawings. The type of work I do—experiential graphic design—has been partially responsible for a shift in my vision. Perhaps the close read of the entry requirements only enhanced some of the issues I have with design competitions. While new lenses helped to better understand the scope of each classification, better sight did not improve my ability to discern the correct category for our work. For a designer who operates on the periphery of many design disciplines—branded environments, signage and wayfinding, and design for narrative environments—I can rarely find a category that is a best fit. Full disclosure: I have juried and I have been judged. So too have Edmund Li and Udo Schliemann of branding and environmental commmunications firm Entro, both of whom I spoke to regarding this opinion piece. 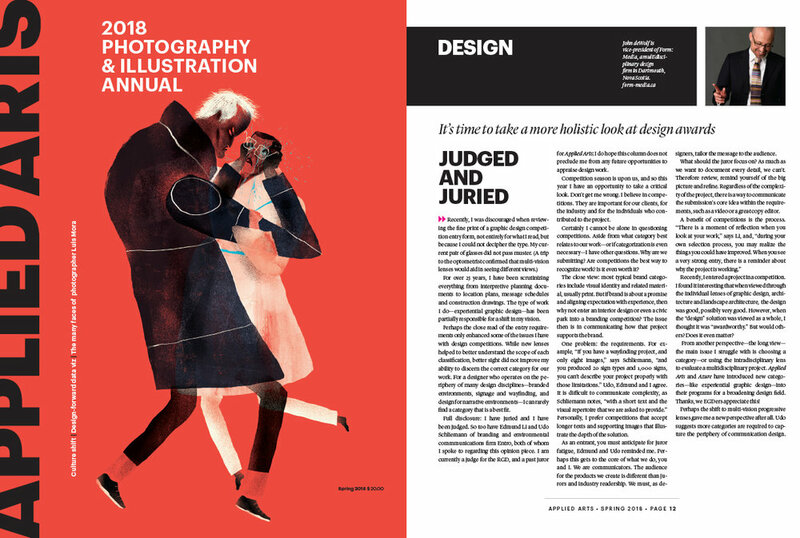 I am currently a judge for the RGD, and a past juror for Applied Arts; I do hope this column does not preclude me from any future opportunities to appraise design work. Competition season is upon us, and so this year I have an opportunity to take a critical look. Don’t get me wrong. I believe in competitions. They are important for our clients, for the industry and for the individuals who contributed to the project. Certainly I cannot be alone in questioning competitions. Aside from what category best relates to our work—or if categorization is even necessary—I have other questions. Why are we submitting? Are competitions the best way to recognize work? Is it even worth it? The close view: most typical brand categories include visual identity and related material, usually print. But if brand is about a promise and aligning expectation with experience, then why not enter an interior design or even a civic park into a branding competition? The issue then is in communicating how that project supports the brand. One problem: the requirements. For example, “If you have a wayfinding project, and only eight images,” says Schliemann, “and you produced 20 sign types and 1,000 signs, you can’t describe your project properly with those limitations.” Udo, Edmund and I agree. It is difficult to communicate complexity, as Schliemann notes, “with a short text and the visual repertoire that we are asked to provide.” Personally, I prefer competitions that accept longer texts and supporting images that illustrate the depth of the solution. As an entrant, you must anticipate for juror fatigue, Edmund and Udo reminded me. Perhaps this gets to the core of what we do, you and I. We are communicators. The audience for the products we create is different than jurors and industry readership. We must, as designers, tailor the message to the audience. What should the juror focus on? As much as we want to document every detail, we can’t. Therefore review, remind yourself of the big picture and refine. Regardless of the complexity of the project, there is a way to communicate the submission’s core idea within the requirements, such as a video or a great copy editor. Recently, I entered a project in a competition. I found it interesting that when viewed through the individual lenses of graphic design, architecture and landscape architecture, the design was good, possibly very good. However, when the “design” solution was viewed as a whole, I thought it was “awardworthy.” But would others? Does it even matter? From another perspective—the long view—the main issue I struggle with is choosing a category—or using the intradisciplinary lens to evaluate a multidisciplinary project. Applied Arts and Azure have introduced new categories—like experiential graphic design—into their programs for a broadening design field. Thanks, we EGDers appreciate this! Perhaps the shift to multi-vision progressive lenses gave me a new perspective after all. Udo suggests more categories are required to capture the periphery of communication design. This is where he and I do not see eye to eye. While intradisciplinary judging levels the playing field, I believe industry as a whole is moving towards a more multidisciplinary approach to design. So too should competitions. Edmund, Udo and I do agree on many points: we enter awards to thank our clients for considering design, as a sign of appreciation for staff and to push the envelope of the design fields. Udo laments, however, that those things “always used to be part of our profession—the social impact, the social-political impact of what we do. That has somehow gotten lost. It’s really more about things of beauty, or the latest tools.” I could not agree more. Ultimately, I envision a competition that is less intradisciplinary in evaluation, and more focussed on how we solve problems through design to benefit society. GDC, RGD, RAIC, IDC and CSLA: it’s time to take a more holistic approach to design awards. Let’s collaborate, in an interdisciplinary way, to envision competitions that celebrate outcome and process, regardless of discipline. That’s a vision of the future I see. Experiential Graphic Design is located at the intersection of landscape architecture, architecture, urban planning and communication design. According to the SEGD (the Society for Experiential Graphic Design), the industry “create[s] content-rich, emotionally compelling, experiential spaces for a wide range of environments” to fuel a dialogue between users and the spaces they inhabit. Experiential graphic designers orchestrate familiar elements of design—typography, color, imagery, form, light and sound—to communicate themes and narratives by means of fixtures in the environment, including signage, panels and objects. Like LAs [Landscape Architects], we consider how and when information is delivered to evoke emotional connections. The same question challenges so many heritage towns: how do you add anything to your community, such as buildings and signage, which respects the past while being relevant to the present? Old Town Lunenburg, for example, is one of the few spots in Canada used for 19th and 20th century period films because it lacks many artifacts of the present-day. Time, however, has taken a toll, perhaps irreversibly on the offshore Atlantic fishery. As traditional industries vanish and society adapts to socio-economic change, communities like Lunenburg must, by virtue their UNESCO designation, carefully protect the fragility of their historic fabric. When our experiential graphic design firm, Form: Media, began to work with Lunenburg to develop a place brand, it was well understood by the town that we “should” use period fixtures and design wooden signs with rope and wrought iron, in keeping with the tradition of boat building, regional design vernacular and the fishery. That said, the sincerest form of flattery may NOT be imitation. Today, material and craft differ vastly from that of over a century ago. When the work is not truthful—fake old—the lack of authenticity impedes the visitors’ ability to understand the value of the artifact—the town. 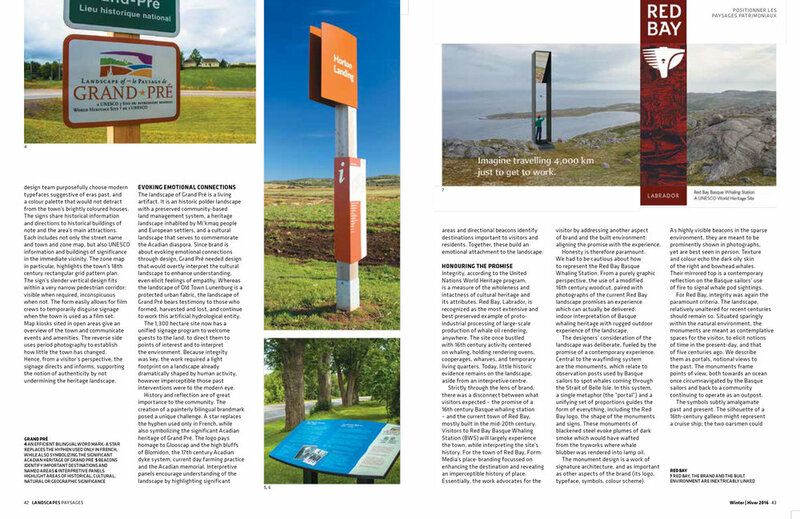 Signage is a modern necessity for most communities, and in cultural heritage landscapes, promotion and interpretation are essential. Taking time for contemplation, Lunenburg chose instead to respect the integrity of the UN designation by implementing signage which would contrast with the town’s historic background, not mimic it. The design team purposefully choose modern typefaces suggestive of eras past, and a colour palette that would not detract from the town’s brightly coloured houses. The signs share historical information and directions to historical buildings of note and the area’s main attractions. Each includes not only the street name and town and zone map, but also UNESCO information and buildings of significance in the immediate vicinity. The zone map in particular, highlights the town’s 18th century rectangular grid pattern plan. The sign’s slender vertical design fits within a very narrow pedestrian corridor: visible when required, inconspicuous when not. The form easily allows for film crews to temporarily disguise signage when the town is used as a film set. Map kiosks sited in open areas give an overview of the town and communicate events and amenities. The reverse side uses period photography to establish how little the town has changed. Hence, from a visitor’s perspective, the signage directs and informs, supporting the notion of authenticity by not undermining the heritage landscape. As Canada’s sesquicentennial celebrations unfold this year, it has been important not to overlook pre-Confederation history and Aboriginal people’s heritage. By way of example, in an effort to help strengthen ties between the federal government and Saskatchewan’s Métis Nation, Form:Media recently ‘dressed’ Lot 47—site of the once-thriving village of Batoche in central Saskatchewan—with an environmental graphic design (EGD) project, which uses signs and related components to tell the tale of the settlement’s history. At the centre of this history is a dispute between two opposing methods of landholding: (a) a linear, river-oriented allotment by an agrarian people versus (b) a less natural grid-based system devised and imposed with a lack of regard for local geographic features. The story proceeded from non-issue to conflict to entente to formal collaboration. For millennia, the Plains were traversed by Blackfoot, Cree, Ojibwa, Assiniboine, Nakota, Dakota and other First Nations. The South Saskatchewan River region, in particular, came to be seen as the physical, cultural and political home of the Métis Nation, which was formed through the mixing of Indigenous and European peoples and, as such, was distinct from Canada’s other Aboriginal peoples. In the late 19th century, a decline in the bison population diminished hunting for the Métis, forcing a transition from a semi-nomadic to an agrarian way of life. The consolidation of the Hudson’s Bay Company and the North West Company also meant fewer Métis traders were employed, so they made do by settling on the land. In 1872, a small number of Métis from the Red River area near Winnipeg (then Fort Garry) established Batoche at the junction of the South Saskatchewan River and the Carlton Trail, a 1,500-km (932-mi) overland route connecting Fort Garry with Fort Edmonton. It was also near a third major trading route, the Humboldt Trail. The town’s name was derived from its founder, Xavier ‘Batoche’ Letendre, who established Lot 47 with his home, a store and a ferry across the river. The approach taken to land division accounted for the importance of trade routes and the relationship of the settlement to the river. Inspired by French methods, the Métis divided the land so every family would have some river frontage. Most lots were about 200 m (656 ft) wide at the riverside and up to 3 km (1.9 mi) long. The settlers used just the riverside land at first for agriculture, then expanded inland to graze cattle, grow larger crops and tend woodlots. Batoche quickly developed as the commercial centre of the overall settlement area, which was home to 800 residents by 1883 and 1,200 by 1885. It had come to be considered the heart of the Métis Nation. After developing their own unique culture throughout the 19thcentury, the Métis were a strong, politically organized force in defending their rights. Throughout the 1880s, they came into confrontation with the newly established government for the Dominion of Canada over a variety of its policies. In particular, the Métis—along with First Nations and white settlers—became concerned about their allotted properties being resurveyed and potentially redistributed under the federal government’s grid-based land survey, which was being conducted across Western Canada. After the government ignored their concerns, the Métis declared a provisional government of Saskatchewan—essentially an independent nation—in March 1885. In response, the federal government dispatched the North-West Mounted Police (NWMP), the forerunner to today’s Royal Canadian Mounted Police (RMCP), to bring an end to what it considered a rebellion. Several battles, including a decisive one at Batoche in May 1885, led to the defeat of the short-lived provisional government. Some Métis families dispersed as Batoche was subjugated and appropriated by a government that saw the village as a commodity over which to exercise its authority. Most left later due to disease and economic factors, such as the building of the railway, which bypassed the village altogether. Yet, even as the Dominion tightened its control of Western Canada, the linear lots on the banks of the South Saskatchewan River remained, as a testament to the community’s resistance. Similarly, the Métis have flourished throughout Western Canada following their dispersion. Today, more than 400,000 people identify themselves as Métis. Shortly before the completion in 2015 of the Truth and Reconciliation Commission of Canada (TRC), Parks Canada undertook an interpretive design process for the national historic site, to help support the Métis’ sense of pride by honouring the pre- and post-battle story of their time in Batoche, in the interest of improving cultural relations. As the federal government agency suggested in its management plan, the site conveys a strong sense of place and importance to both the past and the present, but while it is rich in history and ecology, it has become grossly underused. Given the agency’s mandate to increase visits and revenue for national parks and historic sites across the country by 2017’s Canada 150 celebrations, there was a desire to establish Batoche as a must-see destination for both locals and tourists in central Saskatchewan, with the understanding doing so would require a substantial investment in infrastructure. Over the years, the agency had increasingly found common ground with Aboriginal peoples regarding the establishment and management of areas of natural and cultural significance through constitutionally protected land claim and cost-sharing agreements. In the case of Batoche, the settlement area was designated a national historic site in 1923. Today, it is Crown land managed by Parks Canada in conjunction with the Métis Nation of Saskatchewan, with a shared management board serving as an advisory council. The 955-ha (2,360-acre) landscape of aspen forest and remnant fescue prairie has revealed pre-contact Aboriginal cultural resources dating back more than 6,000 years, though it remained best-known for its evidence of Métis history and the village of Batoche. Several buildings were restored, helping to depict where the village’s inhabitants lived, travelled and fought, but while both Parks Canada and the Métis Nation of Saskatchewan agreed the site conveyed the battle story quite well, they also agreed on the need for a more comprehensive account of Batoche’s culture. So, they commissioned a large-scale outdoor interpretive exhibit. Following symposia and community discussions, a program called ‘Story on the Landscape’ was developed, encompassing a number of related projects, including the acquisition of a shuttle bus, a series of interpretive rest stops, a viewing platform and an interpretive play area. A collection of documents for these projects formed the foundation for a request for proposals (RFP), issued in January 2015. On a raised platform, interpretive panels describe early life in Batoche and illustrate how its river lots were used. The historic land dispute served as the primary source of inspiration for Form:Media’s concept for the EGD project, with the goal of guiding visitors to a better understanding of a wider cultural story, of which the 1885 battle was just one component. The design firm, which is based in Dartmouth, N.S., and specializes in signage, exhibits and other systems for museums and interpretive centres, set out to unite Lot 47’s landscape through the architectural integration of a small number of conspicuous exhibitry placements, rather than imposing a larger number of insertions of smaller signs and graphics throughout the 1,650-m2(17,760-sf) project area. The surviving relics of the past, including building foundations and cellars, would still do most of the storytelling; it was simply a matter of curating the visitor experience with interpretive touches to explain the story further. The client, Parks Canada, required the project to be unique, architecturally interesting and interactive, incorporating historic themes and activities of Batoche in ways that would engage adults, children, families and caregivers. Instead of treating the land as inanimate and placing EGD elements at points along a route, Form:Media worked with the client to showcase the landscape—including the river, the land and the sky—as the central character in the story, reflecting the sacred relationship between Indigenous cultures and nature. Parks Canada’s design brief also emphasized construction using environmentally friendly processes and materials as appropriate. There were also early discussions of making the exhibit ‘period appropriate,’ but as the project progressed, Form:Media chose instead to contrast the site with a contemporary palette. Durable materials, including weathering and galvanized steel, cedar and stone, were chosen to evoke themes of permanence and help minimize the need for future maintenance. A simple mowed/burned strip motif was chosen to reinforce the linearity and direction of the seigneurial river lots. An innovative cedar batten joinery was developed to significantly reduce the size and quantity of fasteners. “Like a woven textile, the inset battens act as structural support, minimizing our need to rely on fasteners,” says Crawford. A wooden panel system was chosen to finish the interiors of the structures, providing an armature for the mounting of the interpretive panels. Visually, it also serves as a reference to the red and white weave of the ceinture fléchée (arrowed sash) of Métis culture. Skyline Atlantic Canada fabricated the interpretive panels and wooden liners, Elance handled steel fabrication and Mennie Design & Build installed all of the components. The structures themselves were raised up on piles, to reduce direct impact on the historic site. The first structure a visitor encounters when travelling to the village site is the ‘viewing lens,’ where cedar planks represent a series of river lots running parallel to each other. This interpretive node sits atop a hill, providing a vantage point to introduce the landscape. A two-panel informational sign on one of the walls provides context. A 730-m (2,395-ft) walk west down the linear path—or ride on the shuttle bus—toward the river leads the visitor to the next structure, the ‘platform,’ which comprises two bodies of weathering steel connected by a wooden stage. Stairs take the visitor up into the first chamber, an open-air enclosure where a pair of interpretive panels set to the left side—combining clear acrylic with screenprinted aluminum—describe how Batoche was chosen as a place to put down roots and what early life was like there. Illustrations show how the river lots were used. After reading those panels, the visitor turns and walks along the stage as a bridge to the second steel chamber. A 6-m (20-ft) long and 300-mm (12-in.) 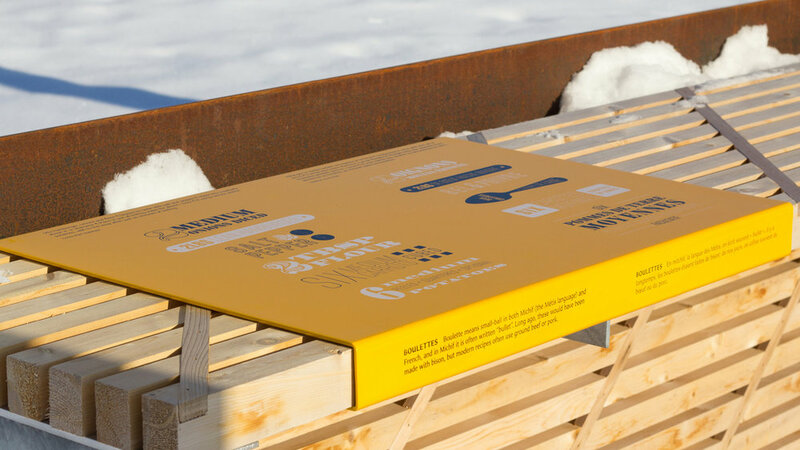 wide handrail uses screenprinted and clearcoated aluminum to illustrate Batoche’s central position among the trade routes over land and water. It allows the visitor to visualize what the village would have looked like, by superimposing photos of buildings on the landscape. In the second chamber, which opens to the sky above, a 5.3-m (17-ft) tall timeline provides an overview of the settlement’s history, with bent metal strips screenprinted with dates and information in English and French marking 50-year spans. By projecting up through the opening, it is meant to suggest an infinite future for the Métis. In addition, the Métis flag—which features the infinity symbol—flies above the tower. A handrail superimposes photos of historic buildings on the landscape to help visualize what the village of Batoche looked like. After exiting the platform, the visitor returns to the land and ends the journey in the family garden. At the centre of this area is the trade route playground, a three-dimensional (3-D) scaled map that demonstrates how people and goods would have moved across Northwestern Canada. Major trading posts and Métis communities are indicated with large, upright log markers, which also serve as beacons above newly introduced saskatoon berry hedgerows. Horizontal half-sawn logs symbolize the main trails. In the family garden’s picnic area, raised countertops feature ‘placemat’ graphics of the foods that were eaten in Batoche. These panels are evocative of 18th– and 19th-century posters, but provide modern cooking techniques and ingredients for traditional fare, including boulettes, bannock, chokecherry syrup and Saskatoon berry crumble. A nearby sandbox demonstrates food preservation techniques, including root cellaring and the use of a pemmican stone to pulverize dried meat. Parks Canada’s multi-faceted goal for this project was to allow the landscape to tell the story of a thriving culture, strengthen ties and serve as a destination. Through a combination of interpretive planning, graphic design and architecture, Form: Media found a way to fulfil that goal. The site opened in August 2016. The following June, it was honoured both with a People’s Choice Award in the inaugural experiential graphic design category of the seventh annual AZ Awards and as a finalist for the annual Society for Experiential Graphic Design (SEGD) Awards in the U.S.
A handrail superimposes photos of historic buildings on the landscape to help visualize what the village of Batoche looked like. Photo by John deWolf, Form:Media. The design process involved determining how informational graphics would be incorporated into the exhibit architecture. The visitor’s journey begins at the ‘viewing lens,’ where a two-panel informational sign provides context.Photo by John deWolf, Form:Media. On a raised platform, interpretive panels describe early life in Batoche and illustrate how its river lots were used. Photo by John deWolf, Form:Media. In the picnic area, raised countertops’ panel graphics explain modern cooking techniques for traditional dishes. Photo by John deWolf, Form:Media. I put little care into my mark making. I have fleeting moments to explore ideas, thus quantity and speed of exploration over the quality of line work is my maxim. My books are neither pretty nor at times legible—coffee or wine stain, bent cover and lost spine are not issues for me. While not precious, losing a book, however, might lead to months of anxiety. Thankfully, I believe I still have ALL of them. They also serve as scrapbooks and wallets; on this day, my journal revealed cash, receipts for reimbursable expenses and a dental appointment card. In addition to being a diary of the affairs of work, my sketchbooks are a means to keep my desk tidy—though rarely it is—the sounds of paper torn and Scotch tape pulled are often heard from my office. Members of the staff jokingly suggest, “scrapbooking?” I rebut, “trying not to lose track of things.” To me, a napkin, drink coaster, even a receipt all are paper waiting for a “eureka” moment. Perhaps my sketchbooks are a loose visual storyboard of me. A collection of scribbles, Post-it notes, and torn paper my sketchbooks reveal an approach that is loose and methodical, scattered and multi-tasking, exploratory and iterative, obvious and ambiguous. 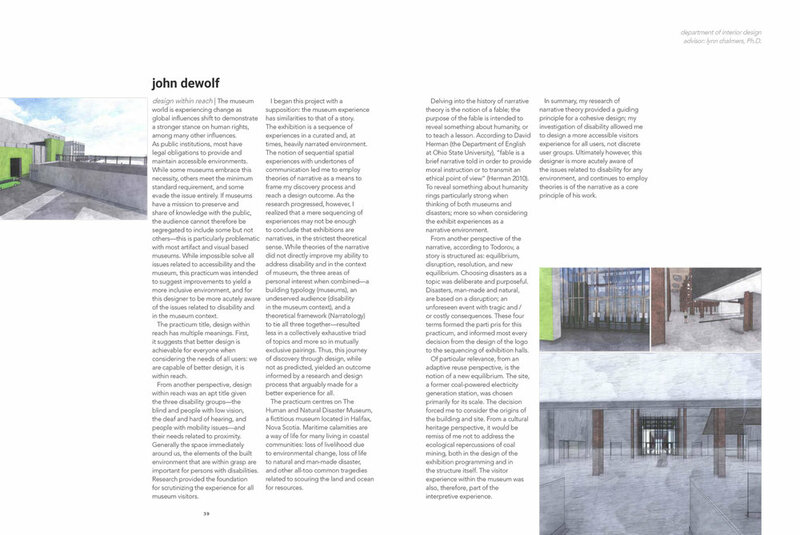 Explore John deWolf’s sketchbook, or find out more about John deWolf on the SEGD's website. Far from precious, my sketchbooks are a chronology of thoughts. From a napkin to kraft paper, I use whatever is available to best explore ideas. The core concept, the big idea: I often try to capture the essence of the project in a parti diagram. Inspiration can come from anything and happen at any time, anywhere. While meaningful to me, my sketches are often illegible to others. My sketches represent an inner monologue, and are not really intended for anyone else. I regularly cut and paste our mood boards to carry around and refer to for inspiration. Design is an iterative process: try try again. Community brands tie the built environment to experience. Retaining the historic fabric of place, while keeping the signage quiet was the goal from this renovation of a landmark building to a library. At times, the parti very much resembles the finished solution, other times it is set of guiding principles. Alliteration—“A” words—is what provoked this solution. The idea of camping inspired us to design/build a mobile visitor kiosk for Parks Canada. The cedar strip built trailer was inspired by traditional canoes and campers, the graphics were inspired by canoe paddles. Refine, then refine again. I always start with drawing before I ever make it to the computer. There must be a core concept. From the bid idea come themes, from themes come topics. While not a copywriter, word play helps me explore ideas. -“Power and participation” influenced everything from the logo, to how the panels interplay with each other. For concepts, hand-drawing still tells enough about the space, without getting hung-up in details of material, lighting, etc.